The first of the Seward Park Centennial events begin on Saturday April 23 in conjunction with Earth Day. There will be a cherry planting ceremony, a birthday party for the Audubon Center and a number of scheduled walking tours. Check out SewardParkCentennial.org for a full listing of events. We're celebrating all year long. April 23, June 4&5, July 16&17 and more. Join us April 23rd at Seward Park to celebrate cherry blossoms, Audubon Center's birthday and Earth Day! Sponsored by Cornish College of the Arts, the Friends of Seward Park, the Seattle Cherry Blossom and Japanese Cultural Festival Committee, Seattle Parks and Recreation, the Seward Park Centennial Committee, the Seward Park Environmental and Audubon Center, and the Washington Native Plant Society. 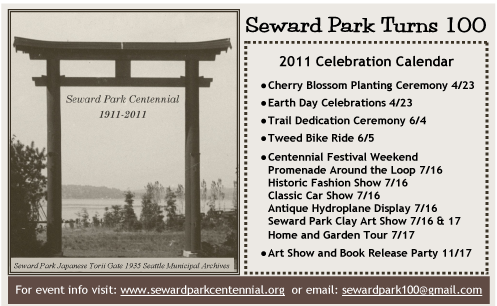 Seward Park turns 100: July 16/17. lots happening!